Do you believe in detox? I’m on a mission and 2 weeks marriage leave. For two weeks i will just sit at my husband home and do nothing means getting my self bigger and bigger. Well, I’m quite scared with my body and my weight at the moment because it’s getting heavier and bigger and i tried so hard to eat as little as i can but even when I’m doing that my weight was not getting lesser. So, to help me with this problem i went to a herbal shop (or jamu shop) in Semua House and asked the sales person there and she recommend me this V’ asia Orangeslym Collagen. 1 box contains 10 sachet rm35 each. drink one sachet every night before you go to sleep. To drink, pour one sachet into 1/3 cup of warm water stir and drink. The effect, the next day you will go to the toilet early in the morning to detox. It’s good for me because I’ve been having problem going to the toilet. I bought 2 box for 10 days and i will weight myself after 20 days to see if it’s working.will review it again after 20 days. 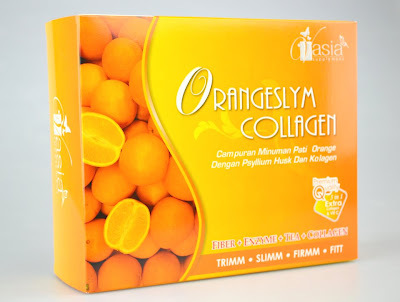 This entry was posted in affordable, beauty and tagged detox, diet, orangeslym collagen, v'asia. Bookmark the permalink. How the detoks Orange its ok…?? ok la,mmg detox pun the next day..tpi asyik sakit perut la pulak. rose tak minum secara consistent so result x nampak sgt..